At 2.55 square miles, the City of St. Francis is one of the smallest suburbs by area in MILWAUKEE COUNTY. According to early white settlers, native residents called the area “Nojoshing,” possibly meaning “strip of land extending into the water.” When the territorial government divided Milwaukee County into townships, Nojoshing became part of the Town of Lake. This elevated land, rising above marshy MILWAUKEE, attracted American and European settlers as farmers beginning around 1834. Several ROMAN CATHOLIC institutions founded in the mid-19th century gave the area a strong Catholic identity. In 1849 Archbishop John Martin Henni directed the Covenant of the Sisters of St. Francis of Assisi to settle just south of Milwaukee. The sisters initially aided orphaned children, but over the next hundred years, they also founded or worked in numerous charitable organizations, including the precursor to CARDINAL STRITCH UNIVERSITY. In 1856, Archbishop Henni’s opened ST. FRANCIS DE SALES SEMINARY nearby. Anchored by the seminary, the area attracted a cluster of Roman Catholic institutions, including Holy Family Normal School, St. John’s School for the Deaf, Sacred Heart Church, the Chapel of the Woods, and St. Aemelian’s Orphanage. 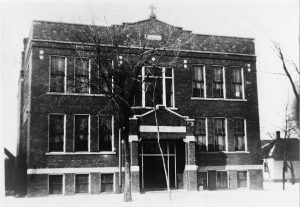 In 1983, the Archdiocese of Milwaukee moved its headquarters to the Cousins Center in St. Francis. In the 1920s, residents began seeking incorporation to prevent annexation by the City of Milwaukee. Those outside of St. Francis in the Town of Lake opposed the move because the Lakeside Power Plant within St. Francis, completed in 1921, provided a large amount of the town’s tax revenue. Attempts to incorporate St. Francis in the 1920s, 1930s, and 1940s failed. When incorporation succeeded in 1951, the city’s population was 6,181. 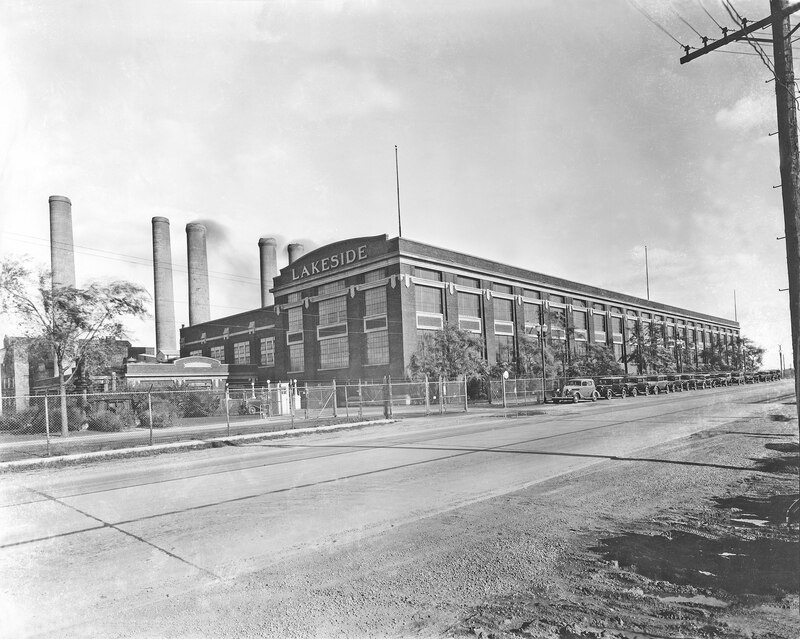 While the newly incorporated St. Francis retained the Lakeside Power Plant, later changes in state laws drastically reduced the amount of tax revenue the City received. Because St. Francis lacked other large businesses to bring in revenue, it had trouble providing adequate municipal services. Some St. Francis residents petitioned for merger with their southern neighbor, CUDAHY. After that effort failed, St. Francis eventually provided its own services. Metropolitan infrastructure was a major political concern in St. Francis. In the 1960s, residents objected to a proposed expansion of GENERAL MITCHELL INTERNATIONAL AIRPORT, which abutted the southwest portion of the city. Although they blocked the expansion, residents complained about airport noise. They also opposed a freeway proposed to run through the city. Its construction threatened to eliminate over one million dollars in assessed property from the tax rolls. While residents’ protests initially stopped the freeway expansion project, in the 1980s they accepted an alternative plan for a 4-lane highway. This parkway differed from the proposed freeway because it had a lower speed limit and decorative landscaping and lighting. The Lake Parkway, which opened in 1999, connected the Hoan Bridge to the airport. The parkway spurred real estate investment in St. Francis, including upscale apartments and condominiums. The new condominium and apartments built in the wake of the Lake Parkway project diversified St. Francis’s housing makeup. In 2010, there were 9,365 residents in St. Francis and of the 4,828 housing units, about half were owner occupied. In that same year, about half of St. Francis’s residents lived in multi-unit structures. ^ “St. Francis (city), Wisconsin,” United States Census Bureau, accessed October 25, 2014. ^ Larry Van Goethem, And So They Came: The History of the City of St. Francis on the Occasion of Its 25th Anniversary, 1951-1976 (Franklin Press, Inc., 1976), 4. ^ Van Goethem, And So They Came, 4. ^ Van Goethem, And So They Came, 7. ^ Mary Eunice Hanousek, A New Assisi: The First Hundred Years of the Sisters of St. Francis of Assisi, Milwaukee, Wisconsin, 1849-1949 (Bruce Pub. Co., 1948), 15. ^ St. Francis Historical Society, St. Francis, Wisconsin: Celebrating 50 Years (n.p. : n.p., 2001), 12. ^ St. Francis Historical Society, St. Francis, Wisconsin, 12; Joseph Rainer, A Noble Priest: Joseph Salzmann, D.D., Founder of the Salesianum (Milwaukee: Olinger and Schwartz, 1903), 106; Steven M. Avella, “Catholic Life in the Archdiocese of Milwaukee: 1843-1965,” 150 Years: Archdiocese of Milwaukee, Catholic Herald, November 18, 1993, p. 18. ^ Steven M. Avella, In the Richness of the Earth: A History of the Archdiocese of Milwaukee, 1853-1958 (Milwaukee: Marquette University Press, 2002), 96. ^ John T. Witchger, “Archdiocesan Offices Move to Center,” Catholic Herald, July 28, 1983. ^ Van Goethem, And So They Came, 11; “Remember When…,” Milwaukee Journal, June 25, 1983, accessed October 25, 2014; “Veto Village of St. Francis,” Milwaukee Sentinel, June 21, 1932, accessed October 25, 2014. ^ Van Goethem, And So They Came, 11; “Fight Is Lost by St. Francis,” Milwaukee Sentinel, October 30, 1931, p. 3; “Veto Village of St. Francis,” Milwaukee Sentinel, June 21, 1932, p. 1; “Surprise Move by St. Francis! Petitions to Incorporate as City,” Milwaukee Sentinel, May 16,1951, p. 9. ^ M.G. Toepel and Hazel L. Kuehn, ed., “Wisconsin Cities and Villages,” in The Wisconsin Blue Book (The State of Wisconsin: Wisconsin, 1956), 606. ^ Avi Lank, “St. Francis Looks to Better Days,” Milwaukee Sentinel, December 9, 1975, accessed October 25, 2014. ^ Bill Kurtz, “Study, Experts Praise St. Francis’ Diversity of Business,” The Milwaukee Journal, December 18, 1987, accessed October 25, 2014. ^ “Two Resolutions Resist City Tie to St. Francis,” Milwaukee Sentinel, March 22, 1961, accessed September 23, 2014. ^ Van Goethem, And So They Came, 12. ^ “First Step Taken for Runway at Airport,” Milwaukee Journal, January 31, 1969, accessed September 30, 2014. ^ “First Step Taken for Runway at Airport,” Milwaukee Journal, January 31, 1969, accessed September 30, 2014; “Airport Expansion Spurs Noise Study,” Milwaukee Sentinel, April 3, 1975 accessed October 2, 2014; “Study on Noise Termed Flawed,” Milwaukee Journal, October 15, 1980, accessed October 2, 2014. ^ “Proposed Freeway Has St. Francis up in Arms,” Milwaukee Sentinel, January 30, 1967, accessed September 30, 2014. ^ Janean Marti, “Hoan Bridge Highway Spurs Concern,” Milwaukee Sentinel, April 15, 1981, accessed September 30, 2014. ^ Bill Kurtz, “Lake Shore Parkway Billed as an Opportunity, Showpiece,” Milwaukee Journal, November 6, 1992, accessed September 30, 2014. ^ Tom Daykin, “Parkway Helping Revitalize Area,” Milwaukee Journal Sentinel, July 27, 2001, accessed September 30, 2014. ^ Nahal Toosi, “Businesses Lukewarm on Giant Project,” The Milwaukee Journal Sentinel, March 5, 2001, accessed October 25, 2014. Hanousek, Mary Eunice. A New Assisi: The First Hundred Years of the Sisters of St. Francis of Assisi, Milwaukee, Wisconsin, 1849-1949. n.p. : Bruce Pub. Co., 1948. St. Francis Historical Society, St. Francis, Wisconsin: Celebrating 50 Years. n.p. ; n.p., 2001. https://wi-stfrancis.civicplus.com/DocumentCenter/View/38. Van Goethem, Larry. And So They Came: The History of the City of St. Francis on the Occasion of its 25th Anniversary, 1951-1976. n.p. : Franklin Press, Inc., 1976. So much history in St. Francis! Katie Steffan did a great job on her article!